We are very interested to know more about which hand left-handers use for various activities, how left-handedness runs in families and how left-handers lives are affected by their hand preference. Please complete this short survey form to tell us about you and your family and we will keep updating our results and the conclusions we draw from them. We would be interested in any comments you may have about the survey or our interpretation of the results. Which hand do you use for the following tasks? What was / is your favourite subject at school / college? What are your main hobbies or interests? 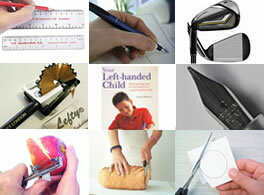 Are there any ways in which being left-handed particularly helps or hinders you? Anything else you think is important? 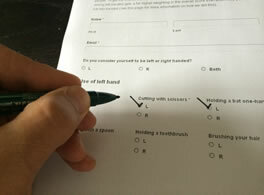 Thank you very much for your time in completing our survey and I am sure that the analysis of your and other left-handers responses will be very interesting and tell us a bit more about ourselves. We will be updating our analysis of the survey results on a regular basis and you can see it under the survey section of this website. We will also update club members with any significant results through our regular newsletters. Although my childhood and starting school happened during the 60’s in Southern Europe, no one has ever tried to push me out of my left handedness. What also no one did, was to give me a preferential treatment just because I was ‘different’. Instead I was motivated to use the tools everyone used:the existing rulers,the existing scissors, learn to write with a fountain pen -that I love.I even learned knitting by looking at a right handed grandma, making sure I would find my way with the two needles!At table I was encouraged to be ambidextrous for a question of politeness to my table partners and with time bottle openers and can openers became no mysteries to me. Unfortunately, I’m the only lefty in my family (up, sides and down)as I believe is a “I dare you!” life circumstance beneficial to any growing person.Have a great Lefty day tomorrow!